1976 - 1978 Camaro - Firebird. Door - T-Top Body & Side - Trunk. High Quality OEM Style Replacements. 1 pair of Door Weatherstrips. 1 pair of Hurst Body T-Top Roof Weatherstrips. 1 pair of Hurst Body T-Top Side Rail Seals. 1 Trunk Weatherstrip / Seal. Fits the following Factory 2nd Design Hurst T-Top Models. 1976 - 1978 Chevrolet Camaro models. 1976 - 1978 Pontiac Firebird models. Hurst Hatch T-Tops came into view/production around 1975 with various Pace Cars & the Hurst Olds Cutlass model. Their T-Tops are generally identified by a H/H Logo in the glass. Hurst Hatches are far more common in the mid 1970s than the other forms of aftermarket t-tops American T-Top, ASC - American Sunroof Corp.
& C & C Cars & Concepts. F-Body models (Pontiac Firebird & Chevrolet Camaro) were equipped with this production option around 1976 but clearly can be retrofitted back to 1970 models since the roofs are the same. Fisher Body T-Tops aka GM Factory Installed debuted in 1978 and are noted to be the larger glass T-Top panels as they went into the roof center much more than the Hurst version. There was a major design revision on both platforms (A-Body and F-Body) Roof Frames and Weather-stripping because of water leaking issues. This is where the terminology of First and Second design stems from regardless of the platform. 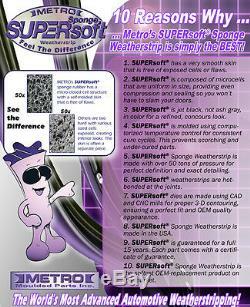 It is important to distinguish the design you have when ordering weather-strip. On the F-Body Models, the 1st & 2nd Design used the SAME GLASS T-Top. The difference is the FRAME being used. There were recalls / customer service issues where 1st Design installed T-Tops had their frames replaced with the second design frames but utilized the original equipped glass from the 1st Design with the only difference to them being a weather-strip change. 1st Design Frames are pretty basic & identified by the use of a clamp & screw style combination on each frame. The clamps were slid into a channel on the aluminum frame and then each screw would either be tightened down to the roof panel itself or to a separate piece of steel bar stock in strategic locations inside the roof. (The bar stock was located between the screw and the roof panel on the inside). The headliner would be glued to this frame and the weather-strip would overlap on the inside to cover this up. 2nd Design Frames are identified by a wider frame as the weather-strip used to control water run off & prevent leaks was much wider. The 2nd Design weather-strip also tapers at the ends to allow clearance for the t-top handles to clear when released or installed. The 2nd Design also utilized reinforcing plates at the bend with an aluminum casting to hold the interior trim but more importantly provided the t-top handle assembly something rigid to clamp against. The hardware used to attach the 2nd Design frames to the roof is totally different than the 1st Design as well. The use of a separate clamp / screw combo has been omitted as the screws are actually set in support bars that are part of the frame assembly. Another obvious improvement with the second design is the use of an interior trim piece that fastened to each frame which helps keep the headliner material in place & provide for a cleaner look. KIT67 LM22B RR7002C ELP7002C TK4610. Has a very smooth skin that is free of exposure cells or flaws. Is composed of micro-closed cells that are uniform in size, providing even compression and sealing so you won't have to slam your doors. Is jet black, not ash gray, for a refined, concourse look. Molded using computerized temperature control for consistent cure cycles. This prevents scorching or undercured parts. Weatherstrips are hot bonded at the joints. Sponge is made in the U. Is guaranteed for a full 15 years. Each parts comes with a certificate of guarantee. 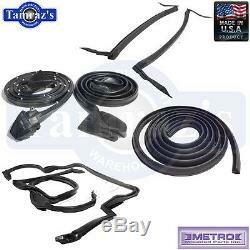 The item "76-8 GM F Body Hurst T-Top T Top Weatherstrip Seal Kit 2nd Design USA MADE Metro" is in sale since Wednesday, March 6, 2019. This item is in the category "eBay Motors\Parts & Accessories\Car & Truck Parts\Exterior\Body Kits". The seller is "tamraz" and is located in Naperville, Illinois. This item can be shipped to United States.